As her lung cancer spread, shortening her breath, pressing into her back, Minna Shakespeare had faith that a thick, brown liquid she bought by mail from a California physician for $13,536 would cure her. Her husband says Mrs. Shakespeare, a registered nurse and devout Christian in Cambridge, Mass., stopped chemotherapy on the doctor’s advice. Easton Shakespeare recalls his wife assuring him that the doctor, who prayed with her over the phone, was trustworthy. Mrs. Shakespeare died in April 2003, four months after her first dose of the viscous liquid. Her husband’s complaints triggered a federal investigation of Christine Daniel, a licensed physician and Pentecostal minister practicing in Mission Hills, Calif. Investigators say she used religion to sell expensive nostrums that she claimed could cure cancer. Dr. Daniel’s small business is part of a boom in “Christian wellness” — dietary supplements and herbal formulas, sometimes along with diets inspired by Biblical descriptions, that sell briskly in a lightly regulated industry. Sales by religiously affiliated companies have surged since the mid-1990s to account for 5% to 10% of the dietary-supplements business, which had about $21 billion in 2005 sales, says Grant Ferrier, editor of Nutrition Business Journal in San Diego. Federal authorities have identified at least three dozen people who drank Dr. Daniel’s mixtures, says a person familiar with the matter. Among those, at least eight people died of cancer, according to a Food and Drug Administration investigator’s affidavit. Some patients bypassed conventional therapies for Dr. Daniel’s regimen, according to the affidavit, patients and family members. In a brief phone interview, Dr. Daniel said she has sold no substances, and only provides palliative “end of life” care. “The federal government has it wrong,” she said, describing federal investigators as “nut cases” and “evil.” She declined requests for further comment. The FDA is looking into allegations that Dr. Daniel violated federal law by introducing an unapproved drug into the market, misbranding a drug, and committing mail and wire fraud, the affidavit says. Prosecutors filed the affidavit under seal in U.S. District Court Los Angeles in January 2006 to obtain a search warrant of Dr. Daniel’s home and office. “There is nothing wrong with a medical doctor claiming that they can cure someone,” said lead prosecutor Joseph O. Johns, an assistant U.S. attorney. “What is illegal is selling an unapproved new drug and claiming that it can cure cancer.’’ A federal grand jury has heard testimony in the case, say lawyers for a witness and for Dr. Daniel, who both testified last year. Mr. Shakespeare thinks the doctor hastened his wife’s death. “She was charging us for one thing, but selling us another,” he says. “I think the operation she had was all a scam. And it was a well-organized scam.” Mr. Miller, Dr. Daniel’s lawyer, said she had done nothing improper in the case. The FDA sent 75 letters last year warning supplement makers of possible violations, while the Federal Trade Commission has brought 126 prosecutions in the past five years against such companies for fraud and deceptive advertising. Critics and government officials say regulators are swamped by the rise in dietary supplements and unable to monitor them all. Jordan Rubin, author of “The Maker’s Diet,” which its publisher says has sold 1.8 million copies, has run afoul of both the FDA and FTC. Mr. Rubin is the founder of Garden of Life Inc., West Palm Beach, Fla., which sells supplements. Mr. Rubin has told church and television audiences that “God healed me” from Crohn’s disease, he said in an interview. In 2004, the FDA warned the company to stop claiming the products could treat illnesses including colon cancer and arthritis. In March 2006, Mr. Rubin and his company settled FTC charges by paying a $225,000 fine and agreeing to change advertising for four products including “Primal Defense,” which the commission said was marketed as a treatment for asthma, lupus, and Crohn’s disease. In an interview, Mr. Rubin said his company had $45 million in sales last year, is in full compliance with the law and plans to start an organic food line. Others have lived within the regulatory limits. Physician Don Colbert, author of “What Would Jesus Eat?” sells supplements through his company, Divine Health Nutritional Products, with plant compounds that the company says are “important in preventing both heart disease and cancer” and strengthening the immune system. Reginald B. Cherry, an Arkansas cardiologist and author of “The Bible Cure,” appears weekly on religious cable channels and says tens of thousands of people buy his herbal products. One with notoginseng and hawthorn berry “may help maintain a normal heart rhythm,” according to his company’s Web site. Both doctors say their marketing complies with federal standards, and no regulators have objected. California’s Dr. Daniel works out of a one-story stucco building with security grates that she shares with a termite-extermination business in Mission Hills, Calif., a dusty working-class and immigrant neighborhood. A petite woman with a quick walk and an arresting smile, Dr. Daniel graduated from Temple University Medical School in 1979 and started practicing medicine in the Los Angeles suburbs the next year. Her practice was housed in several strip malls before her current location in the San Fernando Valley. Along the way she opened the wellness clinic, marketed under several names, alongside her conventional practice, called Sonrise Medical Clinic Inc. They shared a phone number. Dr. Daniel says she has witnessed medical miracles. In a self-published 2006 book, she recounts how, after she prayed, a stroke victim walked without a cane and a drowned child with no vital signs returned to life. “I do not use prayer as a medicinal tool, but a combination of prayer with my medical care has never hurt any patient; if anything, it has saved lives,” Dr. Daniel wrote. She closes her office daily at lunchtime for prayer, she wrote. Traci Wooden, a former receptionist who left in 2004, says staff members would arrange chairs in a circle and invite patients to join in. Dr. Daniel would sometimes pray in tongues — unintelligible speech considered divinely inspired — as she sought Jesus’s help, according to Ms. Wooden. One staff member had the title “prayer counselor,” according to Dr. Daniel’s 2006 book. Over the years, Dr. Daniel acquired a reputation in Los Angeles for helping the downtrodden. “She’s got a generous heart,” says Martha Graham, a civilian employee with the Los Angeles Police Department. The doctor has treated many homeless people and welfare recipients, and volunteered at weekend health fairs, say Ms. Graham and Ms. Wooden. After fires in San Bernardino County in October 2003 drove many residents from their homes, Dr. Daniel donated blankets, diapers and her own clothes, Ms. Graham says. Ms. Wooden says she started work the month after Dr. Daniel publicized her wellness practice on Dec. 5, 2002, on the “Praise the Lord” program on Trinity Broadcasting Network. TBN is television’s largest Christian broadcaster, with 10 million viewers weekly, a network spokesman says. She appeared again in May 2003. After the first show, Ms. Wooden says Dr. Daniel saw as many as 40 patients a week, which gradually dropped to about half that number. About half the patients at any given time were given supplements, she said. According to the FDA affidavit, Dr. Daniel said on the show that her cancer treatment combined prayer with herbs from around the world. She had not found radiation to be effective, she said, but patients with advanced cancer were “living today because of our treatment,” and even her “lowest level” formula had a 60% cure rate. Dr. Daniel told viewers that a Michigan woman whose breast cancer had spread to her brain had normal blood tests within two weeks of taking her first dose, the affidavit said. The network aired the clinic’s phone number. Eugenia Vigiletti from Norwalk, Calif., a retiree with breast cancer, was a viewer who visited the clinic. “I figured Dr. Daniel was honest, otherwise TBN wouldn’t have her on her program,” she says. She paid $1,400 for an office visit, a one-time mixture and heat lamp to shrink her tumor, she says. She didn’t return, after a disagreement over insurance coverage. TBN requires on-air guests to sign waivers absolving the network from liability, says Colby May, outside counsel for TBN, a religious nonprofit. Nobody at TBN “will knowingly put on anybody who is making claims of matters of medical context that are known to not be true,” he says. Dr. Daniel appeared on the show again in May 2003, a network spokesman said. Dr. Daniel also gained patients through her Pentecostal church, New Christ Memorial in San Fernando, where members often testify to medical miracles they say they have experienced. Church member Olivia McClurkin put her faith in Dr. Daniel. A professional gospel singer, she learned she had cancer in both breasts in 1999. While another doctor recommended a mastectomy and chemotherapy, Dr. Daniel told Ms. McClurkin that her treatment would get rid of the tumors, the patient recalls. Dr. Daniel denies saying that, said her attorney Mr. Miller. “She’s not saying that any of her herbs cure cancer,” he says. Ms. McClurkin moved closer to the clinic and visited it daily for 90 days in the spring of 2001. After a staff member prayed with her each day, she says, she drank a concoction with “exotic herbs and roots from Africa” that, she was told, Dr. Daniel collected on twice-yearly trips. Ms. McClurkin said it was thick and muddy and tasted like “hot garbage on a summer day.” Then she swallowed about 20 pills that Dr. Daniel’s staff gave her, she said. She said the doctor and staff would not disclose the composition of the pills or the liquid, despite her repeated inquiries. The tumor initially shrank and Dr. Daniel said she was improving, Ms. McClurkin recounts, but then it began growing through the skin and ulcerating. She says Dr. Daniel then treated it with ointment, with no improvement. After 90 days, Ms. McClurkin told Dr. Daniel she was leaving. “She told me if I left her, I would die,” the patient says. Ms. McClurkin returned to her family’s home in Long Island, N.Y., but didn’t treat the tumor right away. Beginning in 2003, she has had a total mastectomy on her right side, a lumpectomy on her left breast, 19 lymph nodes removed and a hysterectomy, says her doctor, breast cancer surgeon David I. Kaufman. The cancer moved to her lungs, liver, chest wall and several bones. She is bald. Given how long she put off medical treatment, “It’s amazing she survived,” Dr. Kaufman says, adding that her condition is stable. Jean McKinney, a colon-cancer patient, sought Dr. Daniel’s treatment as a last resort after having part of her colon removed and being told by oncologists that she had no medical options left. Starting in December 2003, her husband said, she swallowed a herbal remedy at Dr. Daniel’s clinic and sat under a heat lamp to shrink the tumor. The visits cost $6,000 a week, for which Dr. Daniel would not take insurance, says the patient’s husband, The Rev. George McKinney, a Pentecostal minister in San Diego. Mr. McKinney says Dr. Daniel didn’t promise to cure his wife, but did indicate that “there were persons who came to her with serious cancer and it would be healed.” After three months, he said, Dr. Daniel advised his wife to go into chemotherapy. By May 2004, the cancer had spread to Mrs. McKinney’s uterus and lungs, and she died a month later. Mr. McKinney estimates that Dr. Daniel’s treatment cost $144,000, sending him into debt for a time. Still, he credits the doctor with giving his wife hope for survival that he believes extended her life. “she knew of a lot of people where traditional medicine didn’t work, but when they take her medication, they recover,” he says. A month later, blood tests ordered by Mrs. Shakespeare’s Massachusetts doctor showed her cancer cells were still multiplying. 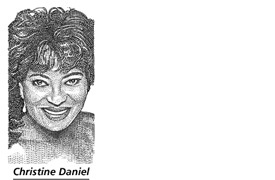 Dr. Daniel then sold her the highest-concentration formula, the husband said. Dr. Daniel wouldn’t tell the couple what the formula consisted of, he said. An FDA lab found that one mixture that Mrs. Shakespeare took contained carbohydrates, ascorbic acid, fructose, protein, alcohol, vitamins and caffeine, according to the agency’s affidavit. Dr. Daniel then advised Mrs. Shakespeare to resume the chemotherapy she had stopped, her husband says. In February, Mrs. Shakespeare stopped taking Dr. Daniel’s liquids and underwent chemotherapy. After his wife’s death, Mr. Shakespeare called Dr. Daniel and demanded a refund. When she refused, Mr. Shakespeare phoned consumer groups, one of which contacted the California Medical Board, triggering a joint investigation with the FDA. In December 2003, Dr. Daniel told an undercover California Medical Board investigator, posing as a cancer victim’s son, that she offered herb mixtures priced from $350 to $4,270 for a formula called C-6 6:4, with the higher concentrations “working better,” the affidavit states. “The FDA does not allow us to say we cure anybody, but this is what we do,” it quotes her as saying. At a meeting with medical board staff in August 2004, Dr. Daniel said she rarely treated cancer, the affidavit states. She said she shipped most cartons of nutritional supplements overseas as part of a food program in developing countries. She remains licensed in California, says a medical board spokeswoman. The case is still under investigation.